We offer the top-of-the-line in paging terminals; The Zetron product family including the 640, 2000 and 2700, CommTech Wireless BasePage 2000, and Visiplex products to suit your needs. The flagship units are the MultiMode 2700 Terminal and CommTech BasePAGE. These units are attached to your existing LAN and will do everything from standard voice and digital paging to email and inter-facility networking. Buy your new Zetron 2000 Series Messaging Terminal here for the most reliable operation and best service. Featuring the 2100 and 2200, The EE Group will provide you with the terminal that fits your needs and facility budget. Why settle for a terminal that has no room for even minimal growth? The 2000 Series will fill the bill today and provide you with extra inputs for that expansion when the budget provides for it. 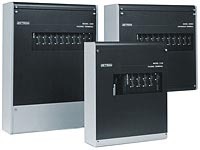 The Zetron 2000 Series Paging Terminals are designed for the paging operator needing a flexible, modular approach to system operation, with the capacity to expand to a region wide or national network. The terminals are incrementally expandable in both capacity and options. The 2000 Series paging operator can offer customers direct system access by analog or digital telephone trunks or through an operator paging bureau. Direct telephone users are instructed through system operation with voice prompts, locally recorded by the system operator. PC and e-mail users have direct access through a server or dial-up modem. The 2000 Series supports zoned (sequential) or synchronized (simulcast) transmitter networks over telephone, microwave or radio based circuits. For national or inter-regional paging, multiple terminals can be networked for increased subscriber capacity and coverage. Subscriber service in regions and across regions is controlled through the system management computer. The 2000 Series can act as the hub of an integrated communications system and are suitable for the larger private paging system. The terminals are incrementally expandable in both capacity and options, so a system can start small and grow as required. The terminals are available with advanced features such as PageSaver voice messaging. They connect with a wide range of PBX or PSTN equipment and can be integrated with security systems, monitoring and control systems, nurse call, product control, building management systems etc. Buy your Zetron DAPT 640 Terminal from The EE Group for the most reliable equipment and best service anywhere. Our network of installers and service companies assures you of the fastest response and best price anywhere. The Model 640 can service all input ports simultaneously for higher traffic applications, sending out pages in user priority. This dial access and PC-driven paging terminal supports up to 1,500 users with up to four telephone lines. Voice pages and numeric or prestored alphanumeric messages may be sent by telephone. Because the Model 640 DAPT-XTRA supports voice paging, voice prompts, and talkback paging, it is ideal for hospitals and public safety organizations that have emergency response teams. Complete messages can be conveyed without an operator typing in a message.